From an early age, children can roll up their sleeves and get involved in helping reduce the amount of trash they produce by participating in recycling programs. Across the country, children will celebrate Earth Day April 22 with science fairs and environmental educational seminars about the importance of recycling. When children start recycling early in life, they’re more likely to continue that behavior as they get older – and pass the practice on to their own kids. Recycling is a growing program in households, cities and schools across the country. In fact, Americans recycled 82 million tons of materials in 2009 – the most recent year for reported data, and that number keeps increasing, according to Keep America Beautiful. School programs are a great way to not only promote recycling in younger generations, but also to create a fundraiser for the schools. This year, as Earth Day approaches April 22, schools can organize aluminum can drives and participate in cash-for-schools programs based on recycling lunch packaging. One such program is The Recycle…Reuse…Replenish Earth Day Campaign which encourages school children to recycle their Entenmann’s Little Bites Pouches with TerraCycle, resulting in cash back to the school. In addition, here are some more recycling, reusing and replenishing tips, perfect for school children to promote every lunch day at the school. Know your numbers – Teach your children to look for numbers and recycling symbols on plastic containers to know which containers can be reused through a recycling program. Sign up for cash back programs – Sign up your school for the TerraCycle program – if it’s not already registered – and have your children recycle their Little Bites pouches each lunch hour. Visit www.terracycle.com/en-US/brigades.html to find a listing of other lunch items TerraCycle collects. Keep the container – Send your children to school with their daily sandwich packaged in a reusable container they can bring home and use again the next day. Let them decorate the container to make it a personal item to show off at lunch. Craft material supplies – Before throwing anything away, teach your children to think about how the material might be reused in a crafting project. TerraCycle provides several do-it-yourself project ideas at www.terracycle.com/en-US/do-it-yourself-projects.html. Have leftovers? 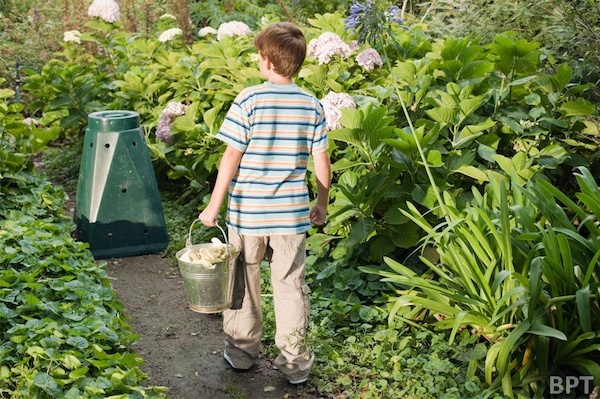 – Set up a compost pile at home, and give your children a lesson in biodegradable foods. Ask them to bring leftovers that are biodegradable home in their sandwich container to add to the compost pile. Grow new lunch materials – Give your children a small garden to plant and tend that contains their favorite vegetables. Show them how beneficial their lunch compost is for growing those plants they can eat at future lunches. Entenmann’s will be giving away weekly prizes, including Little Bites coupons home improvement gift cards for starting an Earth Day garden, and a $5,000 cash grand prize through a sweepstakes link at www.facebook.com/Entenmanns. Register your school now for a chance to win the prize and build a beautiful Earth Day garden. Help teach your children the importance of the three R’s: recycle, reuse and replenish. The earlier they start, the more likely they’ll be to participate the rest of their lives.